ST. PETERSBURG: Tite is deeply religious and likes to visit a church before a match. 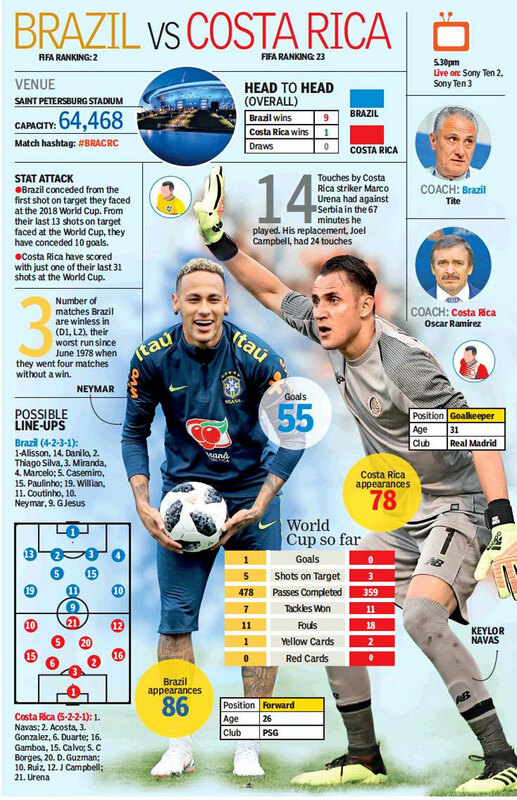 As Brazil prepare to improve their performance against Costa Rica in their second World Cup game on Friday, the Brazilian coach will have innumerable options to choose from for his ritual in this city. Named after Peter the Great, the city was the capital of the Russian Empire for 200 years before the power centre shifted to Moscow in 1918 after the revolution. Exactly 100 years later, as Russia hosts its maiden World Cup, Tite has anchored his star-studded cruiser on the banks of Neva in search of rhythm. Against Switzerland in their opening game, it was sorely missing. Coutinho’s singular brilliance fired the imagination but the boys in yellow faltered into mediocrity as the Swiss dourly, and sometimes brutally, squeezed Neymar out of the game. Brazil can expect similar resistance at the Zenit Arena. Costa Rica usually play with five at the back with Real Madrid goalkeeper Keylor Navas bringing up the rear. Their defensive style surprisingly took them to the quarterfinals in Brazil 2014. Apart from the penalty shootout in the last-eight match against the Netherlands, Costa Rica were unbeaten in Brazil. Scoring seems to be a problem for Los Tico’s who have failed to score in their last four World Cup games. Coming off a defeat in their opener against Serbia, Oscar Ramirez’s side will add some more steel to their determination while facing the five-time World Cup winners. World Cup winner with France, Emmanuel Petit has said in his analysis that Brazil are making the same mistake as Argentina. “I have a feeling that Neymar’s Brazilian teammates tried to pass to him all the time, in the same way the Argentine players do it with Lionel Messi. “It’s like they give it (the ball) to them believing they are going to make the difference, but it doesn’t work like that at a World Cup. It’s not Barcelona or PSG, where you can get away with that. Mentally, Neymar is not ready. One could see that in how frustrated he was on the pitch,” the French midfielder told a British newspaper. The good news from the Brazilian camp is that Neymar got back to normal training after sending shockwaves across the globe on Tuesday when he limped out of a practice session. What the Brazilians lacked was imagination in the midfield once the wings were clipped by the Swiss. If Tite feels that a change is necessary to extend some creative support to Coutinho, then Renato Agusto and Fred are available as options. To decry them on the basis of their opening performance maybe a little too harsh as expectations are rarely known to meet reality. Even when the sun sets in this iconic city on the edge of the Baltic Sea, light lingers till dawn. Can Brazil give reason enough to party in the White Night?